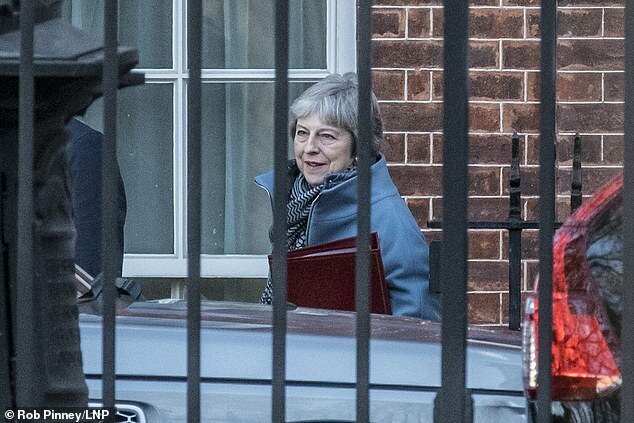 The PM is scrambling to win over mutinous MPs as she stares down the barrel of a disastrous defeat in the vote on her Brexit deal, due to happen next Tuesday. Ministers are said to be urging Mrs May to give Parliament the final say on whether the backstop takes effect, as well as the right to exit the Treaty after 12 months if Brussels is not behaving fairly. A Cabinet source told The Times the government should present the EU with those conditions on a take-it-or-leave-it basis – with no deal the alternative. However, there are currently few signs that the change would satisfy the DUP and Eurosceptics, or that Brussels would agree to those terms. Sources have suggested they are instead proposing an ‘exchange of letters’ with Mrs May, setting out the bloc’s intention to conclude a trade deal by 2021. That timetable would mean the backstop need never come into effect, but experts have voiced scepticism about whether it is possible. 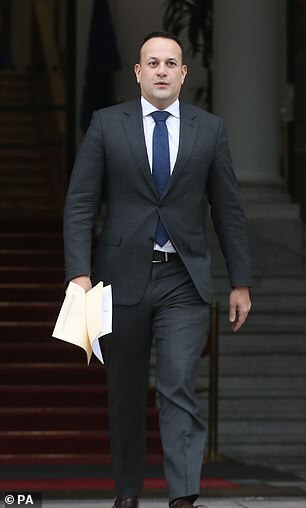 Ireland’s foreign affairs minister Simon Coveney warned MPs that the time for ‘wishful thinking’ is over if the UK wants to avoid crashing out of the EU – and also admitted that his country would be seriously damaged. Speaking at the Global Ireland 2025 Heads of Mission Conference in Dublin, Mr Coveney said: ‘There is no alternative 585-page agreement waiting to be dusted off. ‘And it is also wishful thinking to ignore the default outcome if nothing else is agreed – that default is a crash-out. ‘Surely now is the time in Westminster for everyone, in government and in opposition, to cast aside unrealistic options based on promises that simply cannot be delivered. Ms Loiseau insisted the backstop was a ‘last resort’ for the EU as well as the UK. ‘These are political assurances. But there is nothing more we can do. The withdrawal agreement is indeed a good agreement, both for the UK and the EU. We should stick to it,’ she told reporters. With the prospect of Mrs May’s plan passing the Commons looking vanishingly small, opponents are pushing their own visions of how to proceed. British officials are said to be ‘sounding out’ the EU about delaying Brexit beyond March as Theresa May faces a mounting political crisis. There are claims that the UK has been ‘putting out feelers’ over the prospect of an extension to the Article 50 process. 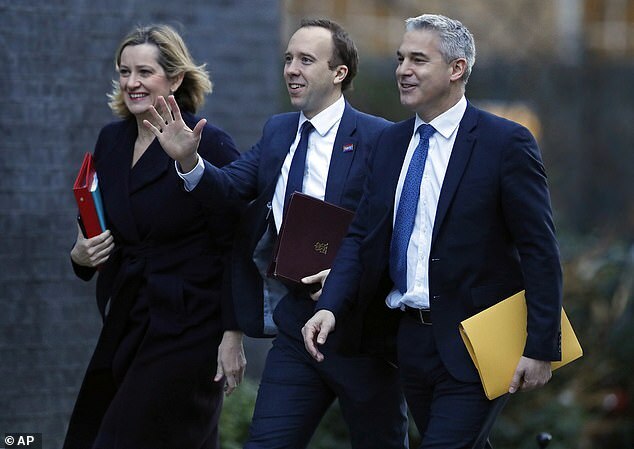 Brexit Secretary Steve Barclay did not completely rule out the prospect this morning – although he insisted government policy is still to leave the EU in March. Ireland has also made clear it would not block any effort to push back the exit date. Labour’s Yvette Cooper and Tory former education secretary Nicky Morgan have tabled an amendment to the Finance Bill today designed to make it harder for the government to push ahead with no deal. The change would effectively limit the Treasury’s tax-raising powers, making it more difficult to respond to the disruption from crashing out. 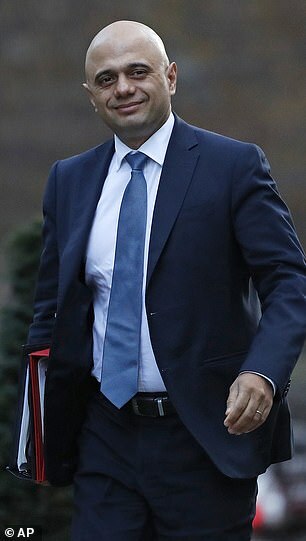 Several Cabinet members, including Justice Secretary David Gauke, have also signalled they would quit – while some Conservatives have insisted they would vote no-confidence in the government to avoid a chaotic departure. Culture minister Margot James yesterday broke ranks to suggest Brexit might have to be delayed if Mrs May’s deal is voted down. According to the Telegraph, EU sources say UK officials are ‘testing the waters’ for extending Article 50. Even if Mrs May’s deal was to pass next week there are serious questions over whether the full legislation would be passed to implement it by March. Mr Barclay this morning insisted the policy was still to leave the bloc at the end of March, and warned an extension would cause ‘very practical issues’. Barclay said: ‘It’s not a unilateral decision for the UK. That is not a decision the UK Government could take, it would require the consent of all 27 member states. Speaking on a visit to Mali, Mr Varadkar said: ‘We don’t want to trap the UK into anything. Mrs May last night began a seven-day charm offensive by inviting all Tory MPs and their partners to drinks in No 10. Those attending included vocal critics such as Boris Johnson. But hardline Eurosceptic MPs warned they would not vote for the deal even if Mrs May achieved a breakthrough on the Irish backstop. Sir Bill Cash, chairman of the Commons European scrutiny committee, said the backstop was ‘not the whole story by any means’. Fellow Eurosceptic Sir John Redwood said opposition to Mrs May’s deal ‘goes way beyond the unacceptable Irish backstop and includes paying huge sums of money with nothing nailed down over the future partnership’.